MONTREAL – After 26 seasons in the NHL, Chris Chelios is hanging up his skates for good. Almost three decades after breaking into the league as a fresh-faced 22-year-old with the Canadiens, the defensive pillar has decided to call it a career. He may be retiring with 1,651 games under his belt – an all-time high amongst NHL blue-liners – but Chelios still remembers where it all began. 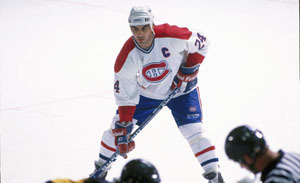 "I have been so fortunate to be on great teams and have great teammates throughout my whole career, starting with the Montreal Canadiens,” offered Chelios, who played his first seven years in Montreal. “I would like to thank [former Canadiens GM] Serge Savard for the support he showed me. He went to bat for me from day one. Looking back at a career that includes four Olympics, 11 All-Star Game appearances, and three Stanley Cups, the 48-year-old Chicago native credits his former Habs teammates for first showing him the ropes. From the day the Habs drafted him 40th overall in 1981 to his final game in the bleu-blanc-rouge in 1990, Chelios knew that helpful advice in his new NHL home was never more than a phone call away. “I was sitting in bars and restaurants with legends – the Richard brothers, Jean Beliveau, Yvan Cournoyer – listening to their stories about when they played; what it took to win,” recalled Chelios. “How all of them put the team in front of any individual play.